I am hosting this week over at JUGS …check it out! since half of the country is experiencing winter it worked out perfectly! I do have a photo of what I used to make my rolling snow hills. to try and cover my mistakes. I intended to have the glittery snow much lighter. All in all, I think it turned out okay. Nancy Penir our Guest Designer this past month. with your work. You are very talented! Thanks for playing along with us! how well they handled my One Layer Winter Theme, you will be impressed! who knows you could be our next Guest Designer. 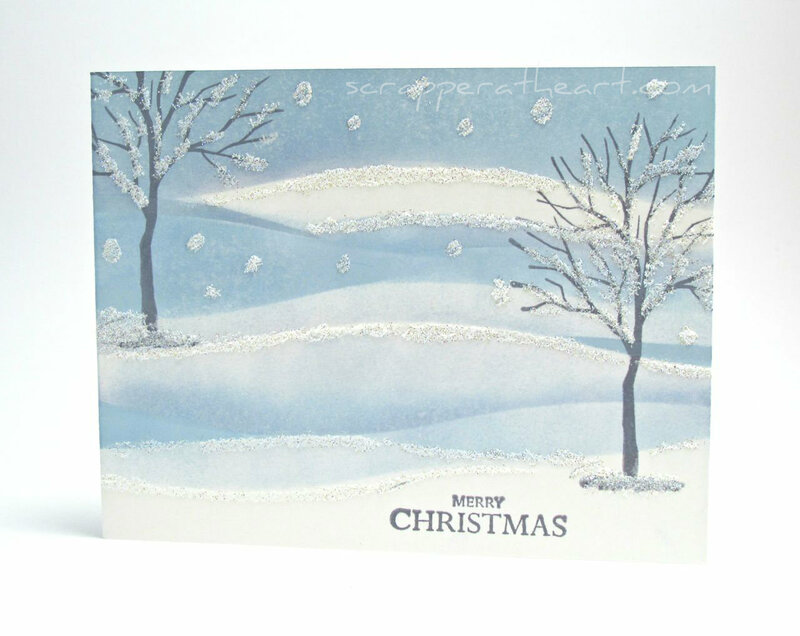 Categories: Cards | Tags: Card making, Cards, Gina K designs, Merry Christmas, one layer, rubber stamps, snow scene, stamping, Stamping Up | Permalink. Such a pretty snow scene!! Nancy, this is gorgeous! I love how you masked those rolling hills and the sparkly snow. 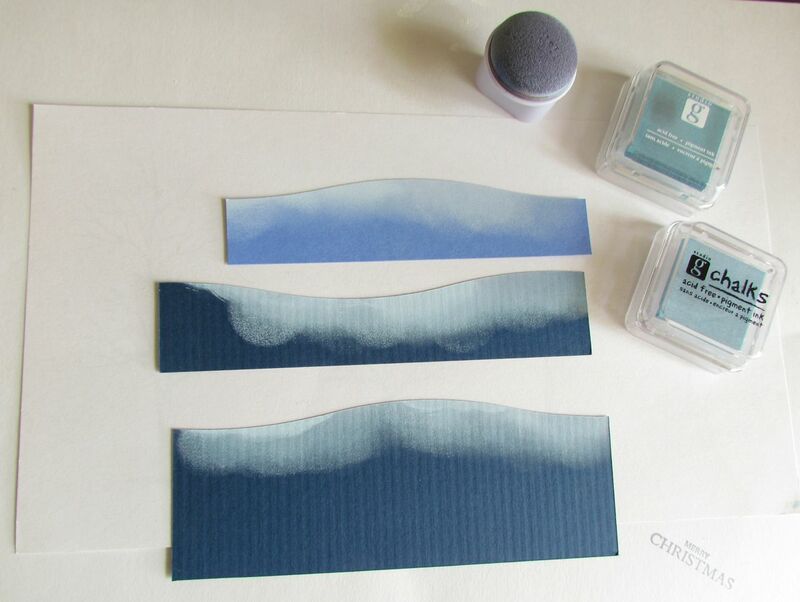 The perfect wintry one-layer card. Your whole card ROCKS! This is exactly how I prefer my snow….on a card….or Christmas Eve, Christmas Morning, and New Year’s Eve, when everyone is where they need to be, of course! Love your snowy hills and the stark scenery! There’s just something so magnificent about a winter tree. Beautiful card, Nancy! I love your Wintery scene! It looks so frosty with the snow on the branches and the flakes coming down. Thanks for showing how you made your rolling snow hills…..beautifully done! Wow, Nancy, a gorgeous scene on a one layer card. Love your snowy hills and the glittery snow. Beautifully done. This is so pretty and looks so dimensional! Not like a one layer card at all! Great challenge! Beautiful! Love the winter scene you created! Your snow hills are gorgeous! The card actually looks frozen! This challenge really pushed me to do something different! Thanks!! Hi Nancy! It’s been awhile since I have had some time to stop by and visit. I hope you are doing well! Oh my I saw your card when I was checking out your challenge. Your card is gorgeous! Thanks for the comment on my blog. STUNNING, Nancy! One of my FAV cards! LOVE the rolling snow hills and the glistening snow!